General William Howe, the British Commander-in-Chief of North America was furious with the defeat at Trenton. He canceled Lieutenant General Charles Cornwallis’ scheduled leave to Britain for the winter and ordered him to Princeton immediately. 8,000 troops converged on Princeton on January 2 and Cornwallis began marching them south toward Trenton, sending an advance guard ahead of the rest. Washington’s men crossed back over the Delaware on the 29th and took up positions south of Trenton on Assunpink Creek. He also sent another line under the command of French Brigadier-General Matthias Alexis Roche de Fermoy north to delay the British advance from Trenton. When the advance line met the oncoming British, they took cover behind trees and in ravines, greatly delaying Cornwallis for much of the day. General Fermoy, who had become drunk, went back to Trenton and Colonel Edward Hand took over the line. 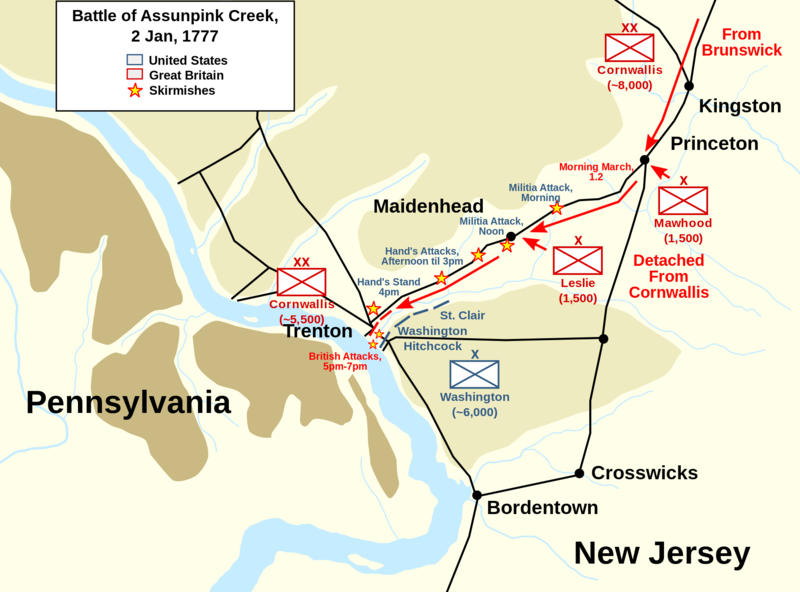 The advance line was finally driven back to Assunpink Creek by twilight and the full British army began an attack on the bridge. Washington’s men held back three assaults from the British, felling hundreds of British soldiers in the process, causing Cornwallis to hold a council to decide what to do. Cornwallis had already lost 365 men to the Battle of Assunpink Creek by this point, while the Americans lost only 100. Some of his officers wanted to attack immediately, while others wanted to wait until morning. Cornwallis ultimately decided to wait until morning, believing the Continentals were already defeated, worn out and had nowhere to go. Washington took advantage of the break. In the middle of the night, he withdrew most of his troops in silence and sent them north to Princeton, leaving 500 soldiers at Assunpink Creek to keep fires burning to make it appear that the army was still there. When Cornwallis arose in the morning, to his horror, Washington’s entire army was gone. They had marched to Princeton and taken over the 1,200 man garrison there, the third American victory in 9 days, forcing the British to withdraw from most of New Jersey and back to New Brunswick and New York City for the winter.